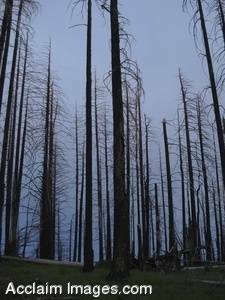 Description: Stock Photo of Burned Trees Southern Oregon. This photograph shows bare trees burned a few years earlier in a huge forest fire. The photo was taken on Grizzly Peak in southern Oregon. This image is available for licensing as stock photography or can be purchased as an art print or a poster.